Disclaimer: This meal was generously sponsored, but the content of the following review is entirely my own. Despite the Fullerton Hotel being one of my favourite hotels, I must confess that I have very rarely dined there, and so I was thrilled to have been invited to a special Peking duck food tasting at Jade, a classy Chinese restaurant located on the second floor of the hotel, and one of the 10 restaurants featured in TimeOut's inaugural Dine Out Tasting Event. As it was a Sunday night, we had the restaurant virtually to ourselves, and we were able to drink in the beautiful setting: the delicately restored finishings of what used to be the old colonial Post Office; the carefully embroidered, virgin white tablecloth; and the tasteful use of verdant bamboo shoots all contributed to serene surroundings. It felt as if I was having dinner on the opulent set of the movie The Banquet. Our meal commenced with an amuse-bouche of chicken mousse, which was a small pyramid of chicken pate that had been slightly browned, served atop a slice of celery, which had been blanched and refreshed to preserve its emerald green hue. The celery was therefore fresh and crunchy, with the unmistakable tang providing a good counterfoil to the rich chicken mousse. Our first course was a roasted Peking duck with marinated orange peel, hoisin sauce and cucumber wrapped in a Chinese pancake. Clearly an attempt to combine both such Oriental and Occidental classics as Peking duck and canard a l'orange in one dish, I felt this was let down by the dryness of the Chinese pancake, which tasted floury and chalky, rather than the smooth and elegant wrapping Peking duck is famous for. The zestiness of the orange, however, was an interesting tough, which worked better than I thought it would, cutting through the sweetness of the hoisin sauce and giving the dish an added complexity. The next course was a luxurious silky chawanmushi with diced duck meat, wild mushrooms and black truffle slices. Sadly, Chinese truffles were used, so there wasn't the same sort of aromatic pungency, but the chawanmushi was excellent. It is always a great pleasure to eat a chawanmushi so smooth it feels like you're drinking a liquid rather than eating a solid, especially when it's flavoured with a rich, tasty duck stock and packed with cubes of wild mushrooms. Our soup course was a duck bone consomme with duck meat dumplings, lemongrass, chilli, coriander and fresh porcini mushrooms. I was very impressed that Jade uses fresh porcini mushrooms, as these are extremely difficult to find in this part of the world. 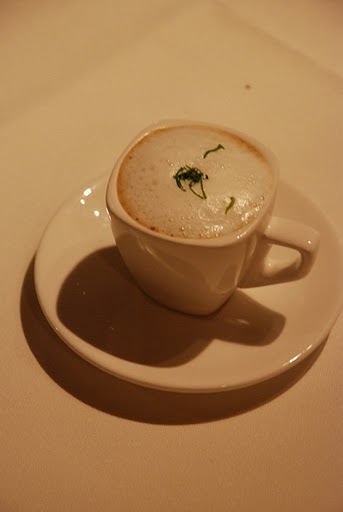 The consomme would have been better, I think, if the chef had not attempted to inject a Thai influence - drinking a spicy soup that was reminiscent of tom yam was somewhat disconcerting in a Chinese restaurant, and I didn't think the combination was successful. Nonetheless, the dumplings were exceptionally good, for they were full of meat, and the skin was so delicate and supple that it was a wonder they didn't simply disintegrate in the soup. An intermezzo followed, in the form of a black sesame lemon sorbet. Clearly, the kitchen in Jade enjoys using exotic or unusual ingredients in surprising combinations, for this is one of the very few occasions I have seen sweet granadilla used as an ingredient. The fruit, which is closely related to the passionfruit, resembles frogspawn, but is mellow and sweet (though less so than passionfruit), and a little crunchy. The sweetness complimented the earthy nuttiness of the black sesame very well, while the hint of lemon, and the icy coolness of the sorbet, did much to cleanse the palate, in preparation for the next dish. Sauteed Peking duck with pan-seared foie gras, roasted garlic and green asparagus was artfully cooked and presented, with a crispy, inverted basket adorning the dish. Pairing duck with foie gras is perhaps a bit rich, but I suppose that is not really a relevant consideration when eating a six course dinner. I was by this time rather full, but managed to find some space for the pineapple fried rice with diced duck meat, crab meat and nyonya chilli served in a crispy money bag. Here again, I felt that the creativity of the chefs had not been put to its best use: the strong taste of the nyonya chilli was not appropriate for the fried rice, which was otherwise extremely appetising, for crabmeat had been supplied in abundance, and the sweet fragrance of the pineapple had permeated the rice grains. Dessert did not, unsurprisingly, feature any more duck. Instead, we were treated to a bowl of shaved coconut ice with fresh strawberries and mango cream. I always enjoy the heady scent of coconut, and when it is made into cream (or better yet, ice cream) without losing any of its allure that is even more remarkable. The strawberries were a little too tart for my tastes, but the mango sauce was satisfyingly sweet. Overall, Jade's Peking Duck menu was not perfect, but at $58 per person, it is very reasonable for the generous amount of food you get, and one can't help but admire the chef's attempts to reinterpret some classic dishes. If duck is not your thing, Jade also offers a host of other set menus, with prices ranging from $48 to $98 per person, as well as a la carte dishes that are fairly affordably priced. Editorial note: This review was requested by TimeOutSingapore. We were not paid for this review but we did not pay for the meal. We arrived at Seven on Club Street on a weekday night and were one of the only tables at this cozy eatery. Club Street in the last few years, has become occupied by random furniture, bridal and eateries, from high end flower stores to seedy golf simulators and unfortunately, has lost quite a bit of its crowd and cache. Seven on Club Street markets itself as Modern European and indeed, the food runs pretty conservative to the core, like the fake flowers in little black vases on each table. The decor of the place pairs heavy wooden beams with bright yellow decals and the place is helmed by Chef Jason Lee. 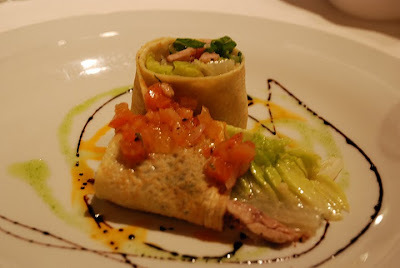 The first course was his take on the caesar wrap ($16), with a parmesan crepe rolled over a mix of lettuce, tomatoes and chicken. This was my least favourite dish, as there was too much oil, leaving my lips oily after eating. The tomatoes were local, light-coloured, grainy and watery. We started dinner at 8.15pm and waited till 8.40pm for the first course but thankfully, the pace of the meal picked up as we went along, with the mushroom cuppuccino of porcini and wild mushroom ($8), arriving at 8.50pm. This was slight contradiction, as the cuppuccino, rather than being light and frothy, was a dense, solid puree of mushroom and bay leaf. It was small and thick and a tad salty. 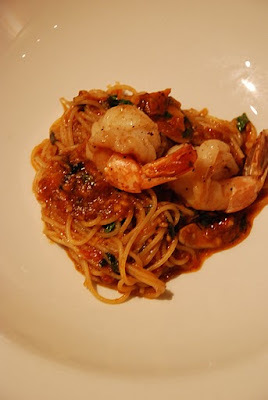 The angel hair pasta of garlic prawns cooked in spicy sundried tomato pesto ($26) and was rich, hot and spicy. Although it was well-cooked, the pasta and garlic was overwhelming and again, left a thick, oily residue on the plate. I would have preferred the pairing of a hot pasta with heaped topping of cold, sweet ebi prawns to really bring out the contrast. The main courses were really the star of the meal, at 9.15pm, we were served the basil crusted chilean seabass ($32) and the grilled tender and juicy beef loin fillet ($28). When I found out that Chef Jason used to cook at Chijmes, at Capella and the Upper Room, it did not surprise me. 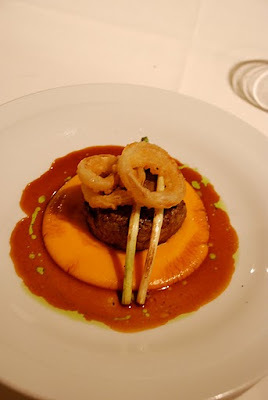 His main courses and even the presentation, were bright, big and strong flavours, the sort that would stand out in a show theatre or a darkened dancefloor dining room. 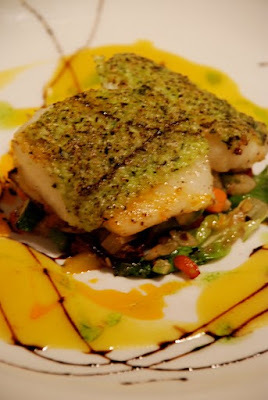 At times, I felt that the flavous were too obvious, for example, I would have liked the basil crusted Chilean seabass with a blander and lighter sauce like a frothy-sweet carrot reduction, rather than laced with saffron sauce, tomato and parsley oil and balsamico reduction. However, the crispy tastiness of his seabass and tenderness of the beef loin were really good and the composition of the plating was very pretty indeed, almost theatrical, with the creation of a saddle on the loin with two peeled asparagus. The dessert of piping hot individual Valrhona chocolate fondue ($14) was the passe epitome of Modern European but I did see on the regular menu, some more unique choices like coconut pudding and lychee panna cotta which I wish we could have tried. The chocolate fondue is Chef Jason's signature and to be fair, it was a lovely dish, warm, runny and rich on the inside. Overall, I found the food well-prepared but not particularly imaginative, although there were mains on the menu like pork loin and duck breast. The menu is fairly small and concrete and not very good value for the pricing but the restaurant does boast a very attractive $28 set lunch. The service for the night may have been overwhelmed by our presence but that goes no way toward explaining the unsmiling, awful service- I've gotten more smiles from old granny stewardesses on British Airways. They were more sulky than stoic, didn't ask what doneness we wanted the meat, didn't top up the bread and of course, didn't refill the waterglasses. Disclaimer: A family acquaintance owns a part share in this restaurant, and was aware of our visit. I do not regard this as in any way compromising the honesty or objectivity of the following review, but you are welcome to form your own conclusions. Regular readers will know that I had, not too long ago, visited Customs House along the Marina Bay waterfront, and extolled the virtues of the marvellous view one is afforded with during the day. Even more recently, I dined at the same area at night, and the view is no less enchanting. People are always asking me for recommendations of places to take their significant others on "special occasions", and there are few better places than the bay area, where you catch a concert or theatre performance before making your way over to the Fullerton district for a sumptuous dinner with a bountiful view. Customs House currently has a handful of restaurants, serving all manner of things from an oyster buffet to Cuban cuisine, but for the time being we were sticking with something safe: comforting and familiar Italian food at Procacci, which was originally (and still is) one of Florence's oldest gourmet shops specialising in truffle based products. The Procacci in Customs House, however, is a full-fledged Italian restaurant, started by a group of wine connoisseurs keen on importing the Procacci concept into Singapore. The interior of the restaurant boasts sensuality: light-coloured parquet flooring contrasts sharply against a striking, jet-black bar counter and dark mahogany tables. Thankfully, the restaurant did not subscribe to the popular habit of dimming the lights to create atmosphere - that might be good for whispering sweet nothings, but is terrible for photography. I generally do not expect much from new restaurants, but we all agreed that dinner that evening was rather exceptional, starting with the calamari, which is more often than not badly done. Procacci, however, got it exactly right: the squid was fresh, tender and succulent, while the batter was light, and fairly crisp (which is no easy feat in our humid weather). Unsurprisingly, the calamari was consumed rather rapidly. Next, we tried the mozzarella cheese, which was served in medallions that had had basil oil drizzled over them, and with thinly-shaved prosciutto ham. The ham, as you can see, is beautiful: glistening with a good quantity of fat that makes your mouth water just to look at it. The cheese was perhaps a little on the dry side, and the combination of ham and cheese, although classic in other contexts, is a bit too rich when it is just the creamy mozzarella and the oleaginous prosciutto. The salumi dish was a colourful medley of salami, pepperoni, mortadella, and other cured meats, mixed with various grilled vegetables, a few olives, and some sticks of hard cheese. Simple, cheerful and tasty - why can't all food be like this? The final dish in our spread of appetisers was a vitello tonnato, or thinly sliced veal with a creamy tuna and caper sauce. In Procacci's case, I believe they use beef rather than veal, which is somewhat more humane. Again, I was fairly impressed with this: the restaurant managed to strike the right balance with the sauce, which was piquant without being overpoweringly salty or spicy. Moving on to main courses, although most of us were too full or unadventurous to order a main course (that was not a pasta), one member of our group took the plunge and settled upon the lamb chops, which came served with some white shimeji mushrooms, and were an excellent choice for a number of reasons. First, they had a sizeable amount of meat on them, and hardly any unappetising gristle or sinew; second, they were deftly cooked to a blushing rose; and third, they were robust and juicy without carrying an overly strong gamey scent. Easily one of the better lamb chops I've tasted in an Italian restaurant. I ordered a porcini mushroom risotto, and was also quite pleased with my meal, as the rice was cooked al dente, as you can see: the grains melding comfortably into the rich, buttery sauce, and so nearly into each other, but retaining just enough of their individuality to be distinguished. The porcini mushrooms were fresh and meaty, while diced onions added a hint of delectable sweetness to the broth. I did not try either the prawn capellini or the crab penne, but, as I did not hear any complaints from anyone who did, I assume that they both went down quite well. Again, we went slightly overboard with desserts and ordered a smorgasboard, beginning with the tiramisu, which I always find is a bit difficult to be objective about, because it's one of those things no one can agree on: some people like the sponge fingers swimming in coffee or alcohol; some people believe that there should be no alcohol, while others think there should be nothing but. Personally, I like my tiramisus a bit on the dry side: the biscuit base should not expel fluid when I bite into it, and the mascarpone/zabaglione should be stiff rather than mushy. Procacci's tiramisu satisfied my requirements, and while a bit low on the alcohol content, it was packed with caffeine, so it really would be churlish to complain. I cannot remember the exact name of this dessert, as it was in Italian, but it was described (not inaccurately) as a millefeuille. A picture is worth a thousand words, however, and this really was a gorgeously-presented dessert. The puff pastry had risen to magnificent heights, and the light dusting of icing sugar on top was reminiscent of a light snowfall, while the strawberries were a full-blooded, crimson hue. The profiteroles are filled with chantilly cream rather than vanilla ice cream, and are slathered with a dark chocolate sauce before being sprinkled liberally with almond flakes. A similar abundance of almonds is to be found on the chocolate tart, which is a shame, as I hate almond flakes, but otherwise the chocolate tart was quite outstanding, as the tart filling was dense, dark, rich and intense, while the crust was savoury and crumbly. Accompanying the tart is a small bowl of citrus fruits, which I assume is to aid in cutting through the richness of the chocolate, though I think that is the point of dessert - no one serves ice cream with a slice of lemon, after all. In any event, a similar bowl accompanied the panna cotta, which was very good. Wobbly, creamy and flecked through with vanilla beans, the panna cotta here is among one of the better ones I've had, which is saying quite a lot, considering my fairly high standards here. If it's not already clear, I was impressed with Procacci. Italian food is frightfully common in Singapore, and often it ranges from uninspiring to downright awful. The food at Procacci, thankfully, is of a fairly high quality, and while prices cannot be said to be a bargain, neither are they exorbitant - they are on par with higher-end Italian eateries like Garibaldi or Oso - and for what you get, I think it's worth the money. Perhaps, even, the place to splurge for a "special occasion". A few months ago, I had a very surreal experience. At the house of a family friend(the house belongs to a Queen Mother, so let's call her royal highness Princess Ice) I tried a Darjeeling Tea Tart, leftover from a dinner cooked by a scion-turned-private-chef. Let's call him Chef Princeling. This tart was dreamy in its soft suppleness yet perfectly balanced with a great wallop of flavour. The tart dough was crispy, yet crusty and savoury. In short, it was a remarkable tart. So I immediately began to back-engineer it. From the edges of the tart, which showed minute signs of defrosting and curdling, I felt that the filling had to be some sort of cooled custard, probably an emulsified cream, like in Pierre Herme's Lemon Cream, found in Dorie Greenspan's Baking: From My Home To Yours. When I asked after Chef Princeling, the haughty Princess sniffed that the tarts cost more than $50 to make each because he used very expensive tea dust, branded at more than $40 for just a few grams. Stung by the ridicule of this insinuation (I can be a food purist, no doubt but I paticularly detest price-related food snobbery) and with just a name and an incomplete analysis to build a dream on, I turned to the All-Mighty Facebook, where princes apparently reside because I found Chef Princeling. Who, being the princely sort that he is, offered the recipe, a tart-making demonstration and an invitation to a ball. A ball where they would roast a whole Babi Guling and ten thousand fowls beside. The funny thing is, when I picked up the recipe, I laughed outloud to see that it was straight out of Dorie Greenspan's Paris Sweets. And, alright, in the name of full disclosure, I was a little disappointed that the recipe wasn't a unique one born of his own sweat and tears (what can I say, Karen aka MadBaker's culinary tenacity has spoilt me) but still, a prince who researches from Dorie Greenspan and holds royal feasts, is admittedly charming. Somehow, in the midst of all Dorie's fancier recipes, this cookbook gem had been passed over. I could barely find any reference to it online and only belated discovered that there is actually such a tart on sale at Fauchon (and I didn't get to taste it while in Paris). I wound up passing on Chef Princeling's baking demonstration, as his kaleidescopic timing proved too much for my macaron schedule, so that left just dinner at the castle. While that wasn't Ibu Oka, there were almost ten thousand crowded bodies beside, as I found out there was more to the private chef gig than met the eye. Having spent too much time swanning about in the la-la land of privledged excess, I decided that, much like Drew Barrymore's new-age Cinderella, I was going to roll up my own sleeves and clock in some kitchen experimenting of my own to discover the secrets of this recipe. Armed with my loyal troupe of guinea-pig mice friends who ate their way through 8 tarts of varying thickness and texture, I now present a very tried-and-tested recipe for a Darjeeling Tart that is truly, the stuff that fairytales are made from. (3) With the beater on a slow tempo, add the flour and stop the mixer as soon as the dough begins to clump together. Do not overwork the dough. (4) Divide the dough into 4 lumps, wrap with clingfilm and refrigerate overnight. Let it thaw for 20 minutes before using. If more than 3 days old, store in freezer. This recipe is fairly complex but not difficult to execute. The tart base is so good because it has a high proportion of butter, which, as she says in her book, makes the dough soft and hard to work with. When I make this dough, I tend to add 1/2 - 1 more cup of plain flour than is called for in the recipe, which makes it easier to handle but not as melt-in-your-mouthfeel. If you do not add the extra flour, you will notice that the dough is almost literally butter. The addition of ground nuts to the dough subtlely alters the taste and gives a bit more bite to the tart base. Dorie suggests using ground hazlenuts, as they do in Fauchon, rather than ground almonds. I recycle the ground nuts that were too large to pass through macaron sieves, so I use a mix of 1/2 almonds and hazlenuts but from my experience, a larger proportion of hazlenuts tastes noticeably better. Not working the dough overly keeps it suppleness and keeping the dough refrigerated overnight is very important for drying out the dough to develop a good crust and it can also be frozen for future use. This recipe makes enough dough for 3 9-inch tart pans and frozen tart dough (that you've forgotten about) when you need a quick dessert? A Godsend. If you aren't the sort that likes to fiddle with beans and pie weights, refrigerate the dough pressed into the tart pan and transfer it, still cold, into the oven. That way, the tart will keep its shape better and stay relatively flat. If it does start to rise, throw a sheet of parchment over the and a tea towel into the tart center to weigh it down. 2) In a metal bowl, mix the eggs, sugar and 3/4 cup of tea together. Set this bowl over a saucepan of boiling water on the stove. With the heat on, stir the custard ingredients together until it starts to thicken. Stop when your whisks leaves tracks in the custard and the texture becomes like a smooth porridge, should take about 10-15 minutes depending on the heat. Whisk frequently, scraping down the sides and bottem of the bowl, so that the custard cooks evenly without scrambling. 3) When thickened, remove the bowl from heat and refrigerate until the mixture is completely cooled. 4) Sprinkle the gelatin powder on 1/4 cup of the remaining tea. Microwave for 15 seconds to dissolve the gelatin. Pour into the custard while the custard is still warm and whisk to mix. 5) After the custard has cooled completely, pour it into a blender and with the blender going, add the pieces of butter, which will thicken the mixture. Keep the blender on till the filling is completely mixed and thickened. 6) Pour into the cooled tart base and refrigerate for at least 3-4 hours before serving. The Darjeeling tea filling is really a creative genius spin that brings out the best chemical properties of eggs and butter, it sounds nifty but if you follow the steps closely, you should get a result that really bedazzles the senses. Like most french dessert recipes though, a small misstep and you'll wind up with an abject failure. Trust me, I've tried more times than I care to remember. The first part is that the tea steeped has to be as strong as possible. You need about 3/4cup of strong tea for this recipe and I've discovered that you lose about 1/2 cup of water in the brewing process, so when I usually start with 1 1/2 cups and wind up with 1 cup of strong tea. This tea is made into a custurd and then a cream, so the tea taste can become quite milky and diluted. Bearing that in mind, I use about 4 Tbsp of loose-leaf tea, instead of the prescribed amount in the recipe and I actually think that if you increase the amount of tea even further, it would improve the taste of the eventual tart. I was told by Chef Prince that using tea dust, instead of tea leaves, would help the taste to infuse better. I suspect that if you grind your tea leaves before infusing, or boil the tea leaves with the water, this might help to get a stronger tea. I also tried blending the tea and tea leaves after steeping (marginally more effective). I don't actually like Darjeeling Tea, I find it astringently tannic and musky but when I first came to this recipe, I dug around in the recesses of my pantry and by happy coincidence, found a can of Mariage Freres Darjeeling Princeton loose-leaf tea that I had been gifted with. This was a rather pricey tea to begin experimenting with but it did make a kick-arse tea flavour. Later on, sceptical of Princess Ice's "$40 for a few grams of tea dust" judgementalism (and rightly so, since tea dust is the reject of the gourmet tea manufacturing process- the smaller the particle, the lower the quality and price), I experimented with regular tea bags. These were not exactly economical, as I had to use 12 tea bags at a go and even then, the tea was watery, weak and milkier in taste. While in Paris, I picked up a big can of Twinings loose leaf Grand Himalayan Darjeeling tea. At $7 euro for 200g (as opposed to Mariage Freres at $12 euro for 100g), I made two exact tarts, one of which was the Mariage Freres and the other which was 1/4th the price. The difference was visible from steeping, the more expensive tea was a lighter brown shade, with a rich crema on the surface. However, in a blind taste test of the two eventual tarts, most of the 8 testers said there wasn't an appreciable difference, although all 8 were able to identify the more expensive tea and the most cited reason was that the Mariage Freres tart had the kick and aftertaste of a "second, floral aroma". When making the custard over a bain-marie, make sure to use a metal bowl, the first time I used a glass bowl and we were whisking forever. I've found that a Kitchen Aid metal mixer bowl has a narrow base that could be easily submerged and it's thick handle doesn't transmit the heat, enabling me to hold the bowl while whisking. It also went conveniently from bain-marie to freezer, where the metal surface enabled the custard to cool quickly. I make my gelatin mix with the leftover tea, rather than using water as in the original recipe (gelatin does not melt as easily in tea but it doesn't really make a difference, as long as the powder dissipates completely). You must add in the gelatin mix while the custard is still hot, to give the gelatin a chance to mix evenly but must cool the custard throughly before proceeding to the next step of blending in the butter. If you try to emulsify the custard when it is still warm, the butter will simply melt and the mixture, rather than thickening, will grow even more liquid. The texture of the tart should be firm but airy-light and velveteen, not gelatinously hard but definitely not soupy. If you emulsify the butter correctly and at a cold temperature, you should need no more than the 1 tsp of gelatin set out here. If the mixture is not cold when you blend in the butter, then you will likely find that you wind up with a filling that doesn't set, or need 2 tsp at least of gelatin to help it set. Of course, if you are trying to cut down the butter content, then you are best advised to increase the gelatin amount but it's really the butter that gives the gorgeous lightness to the tart filling. The emulsified tea cream tastes superbly of tea and upon hardening in the fridge, can be used as a filling for macarons. I suspect, given who pioneered this method, that this might be the way that Pierre Herme makes the filling for his jasmin tea macarons. I've also tried this same method for a Earl Grey tea tart, it can be done but did not taste as good, the taste was not as characteristically tea-like and was somehow heavier, more flat and bitter. In her recipe, Dorie Greenspan gives an additional recipe for buttery hazlenut strudel which she strews on top of the tart. This seemed gratitously fattening and it would muck up the beautiful smooth glossy surface of the tart, so I omit it but it's also because I'm not a crust person. If you are, you might like to make the streudel and you can find the recipe in her book. From one Italian hotel restaurant to another, I was recently treated to a meal at Pontini, the flagship restaurant of the Grand Copthorne Waterfront Hotel, by my generous cousins W and K, as it was my birthday and they had not seen me in a while. The restaurant is quite a lovely, spacious affair, with fairly magnificent views across the Singapore river, and a live pianist to boot. Parking is also a breeze, and the restaurant is generous in its dispensations of complimentary parking tickets. You shouldn't have too much difficulty reaching the restaurant after work, especially if you work in the Central Business District, though you might bump into the rabid Zouk crowd if you linger too long over dinner. Pontini also has a dedicated pizza oven, which is gas-fired, but they compensate by burning a few sticks of wood in the oven, which makes a big difference to the taste of their pizzas, as they emerge with a wonderful smokey aroma. I was a bit dismayed however, when, as we placed our order for a pizza with parma ham and arugula, the restaurant told us that they had run out of arugula leaves. The only thing worse than an Italian restaurant with no arugula is a French restaurant with no butter, but thankfully the damage was mitigated when the restaurant suggested replacing the arugula on the pizza with mixed salad leaves. Not a perfect solution, but better than having no pizza at all, I suppose. Apart from that, the pizza was delectable, boasting a remarkably thin crust which was crispy, and not too moist. Pontini's pastas are not very large affairs, which is a good thing for those of us with small appetites induced by a persistent influenza bug. The vongole I thought a bit too salty, but the other pasta dishes looked pretty good. Moving on to desserts, the molten chocolate cake is warm and oozing with melted chocolate, but not so rich and viscous that you feel ill after eating it, which is sometimes the case with cakes that are too dense and dark. The panna cotta, however, is rather bizarre: it comes as two hemispheres of firm (perhaps too firm) cream, surrounded with dehydrated wild strawberries and watermelon sorbet. Although red on white is a natural colour contrast, the texture of the dehydrated fruits was not complementary - they felt somewhat leathery and worn out - and the pairing of watermelon with cream is not a natural flavour combination. Thankfully, the meal ended on a high note, as the tiramisu was both delectable and inventive. The cream was pillowy, and not rigid, while the sponge fingers moist, but not soggy. Creatively, instead of soaking the sponge fingers in coffee, and allowing that to percolate through the cream, cubes of espresso jelly were added instead, which ensured that the tiramisu retained the requisite caffeinated kick, but without upsetting the overall moisture content. 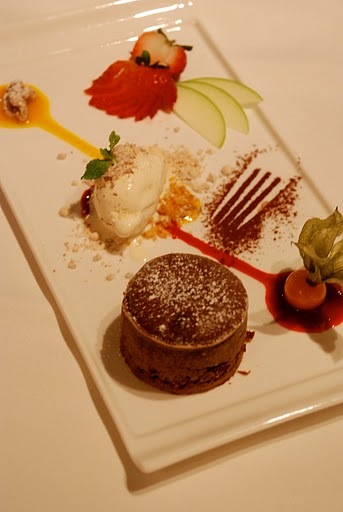 What distinguishes Pontini from other Italian-themed hotel restaurants like Basilico or Prego? For one thing, the pizzas at Pontini are outstandingly thin, and that crusty smokiness will be sure to make your mouth water. In addition, because Pontini does not, unlike Prego, attempt to cater to enormous crowds, you will find the ambience here pleasant and soothing, and the waitstaff are, by and large, not harried or frazzled. Even if the rest of the food is not always consistent, these qualities alone would make Pontini worthy of serious consideration if you are looking for a slightly more upmarket lunch venue, or a romantic dinner spot. I always find it difficult to reply when people ask me about buffets in Singapore, as they always bring to mind tasteless, overcooked food languishing in sterile, stainless steel containers, kept lukewarm with little tealights. That depends, however, on the kind of buffets one is talking about, as these days buffets are becoming increasingly sophisticated. One of the more delicious buffets is that offered by Basilico, an Italian restaurant at Regent Hotel, just off Orchard Road, and which boasts outstanding ratings on Tripadvisor.com, with reviewers lauding the excellent service, as well as the quality of food on offer. The hotel itself is quite beautiful: light streams in constantly, bannisters and hallways criss-cross each other, creating a palatial effect as you ascend spiral staircases, above gleaming salmon marble flooring that winks up at you. I can well see why I would want to stay here if I was on vacation. Basilico is an oddly-shaped restaurant, as the main food hall is circular, and a number of alcoves are attached, where the bulk of the diners are seated to enjoy their meals. The food on display is, unsurprisingly, mainly Italian, although there was a station which served, rather incongruously, fried man tous and roast duck, among other Chinese foodstuffs. At the grill station, you can have grilled chicken, grilled fish, grilled beef, grilled vegetables... basically anything that can be grilled or spit-roasted. Honestly, who can resist morsels like these? Generous chunks of beef, warmed through by the cheery Le Creuset griddle they are resting on, and bearing their grill marks proudly, as if they were battlescars on old war veterans. There is, of course, a pasta station, where your orders are cooked a la minute. The sauces and pastas are on display are rather limited, but the chefs will be happy to entertain special requests, within reason (i.e. aglio olio is certainly possible, but perhaps not vongole). No self-respecting Italian buffet would be complete without Italian cold meats, and Basilico does not disappoint with a spread of motardella, salami, and prosciutto. Next to this was a tray of sliced heirloom tomatoes, surrounded by burrata on the left and mozzarella on the right: basically you get to create your own caprese salad, with very enjoyable results. And if all that meat isn't enough for you, there is a salad table, where you're spoilt for choice amidst the roast duck salad, the mushroom salad, arugula leaves and other vegetarian options. The dessert counter (in fact all the food counters) is a lot more extensive than what I've managed to photograph here, as at some point one of the staff told me that photography was not allowed without prior arrangement, but there is an assortment of temptations such as fig mousse, chocolate shooters, and gelato. If sweet desserts are not quite your thing, there are a number of lovely cheeses on display, from the salty parmiggiano, to the more unusual fiore sardo (a type of pecorino). Of course, the usual accompaniments such as honey, grapes, and quince paste were available too. For those who enjoy a big meal, Basilico is a good choice, for there's plenty of food available, much of it freshly cooked, sliced or tossed, so that there's no chance that you end up with a soggy, scraggly, sorry-looking meal. Basilico's convenient location on the outskirts of Orchard Road also mean that you can shop off the post-lunch stupor.